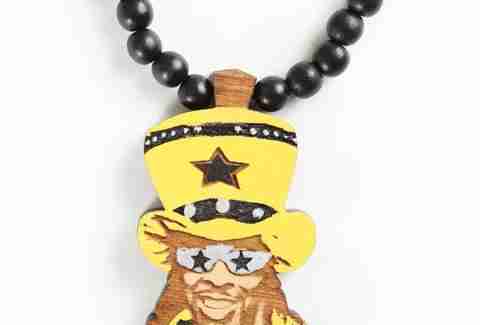 Bootsy Collins X Good Wood Speaking of Bootzilla, the tree-heavy BK mewelry makers teamed up with him to create a capsule collection of wood pins, necklaces, and bracelets blessed with his top hat & star-shaded visage, fitting considering he can play a mean basswood. 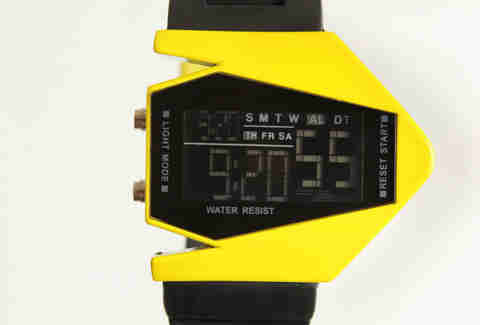 Girl Talk X Dumb Watches The mashup-meister and the eye-popping wrist-ticker...ers are pumping out black-strapped timepieces with bright yellow, sideways-spaceship-esque faces, each engraved on the underside with GT's laser logo to commemorate his album All Day, which is no longer how long people should have to wait for you now that you have a watch. 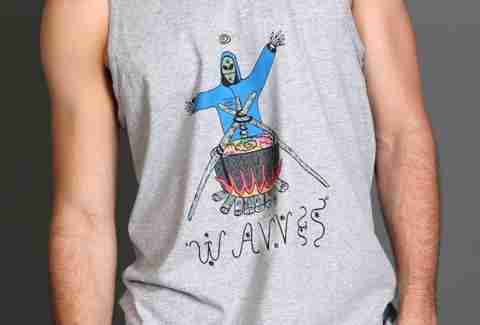 Wavves X Copy Clothing This grey tank top features a robed alien-like figure lording over a cauldron of neon colors, designed by the SoCal "noise pop" band's in-house graphic artist, who's handled all their album art, and hopefully none of their spelling. Big Boi X Android Homme The high-end kick concern cozied up with Boi on a high-top inspired by his hit "General Patton", with a smooth tan leather upper, hunter green leather vamp/Velcro lace straps, and a thin patent leather binding along the upper heel and tongue, a great chance to rock the spirit of the festival, as after a few wearings they'll totally Stank-onya.